Last Monday, a sobering panel discussion was held in Norfolk, Virginia regarding the threat posed by sea level rise to both national security, and the Hampton Roads region – an area which comprises Virginia Beach, Norfolk-Newport News, and the Virginia-North Carolina metropolitan area. The panel consisted of U.S. Navy Vice Admiral Philip Cullom, Admiral Larry Baucom, USN (ret), Captain Joe Bouchard, USN (ret. ), Jonathan Powers, Iraq war veteran and the White House’s Federal Environmental Executive, and Ben McFarlane of the Hampton Roads Planning Commission. The Hampton Roads region is significant not only for its hundreds of miles of beaches, which contribute significantly to the economies of Virginia and North Carolina, but also for a harbor that houses “Navy, Coast Guard, Air Force, NASA, Marine Corps, and Army facilities, shipyards, [and] coal piers.” Consequently, sea level rise along the lines of recent projections would be devastating for both the economy of the region (and economies outside the region that are fed by the harbor), and the significant assets of the U.S. military in the area – which incidentally, provide thousands of jobs. It is no small wonder that military leaders, as well as those responsible for keeping the region’s economy thriving, are concerned about the effects of climate change. 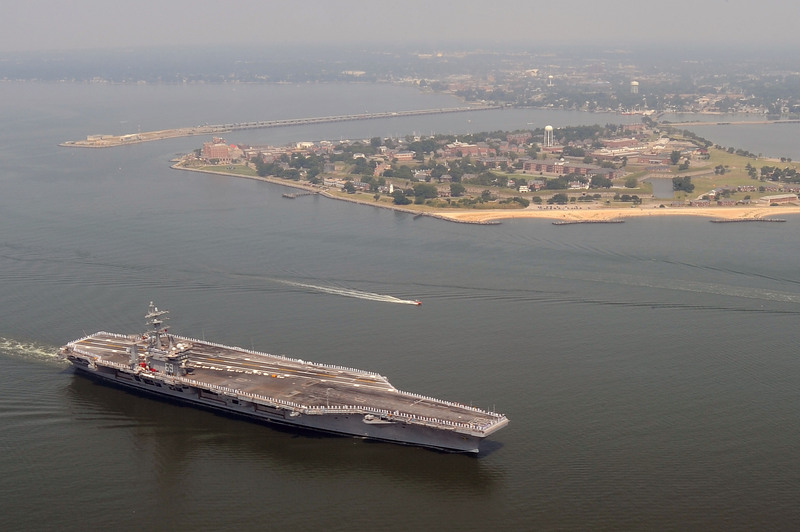 Hampton Roads is threatened by rising sea level, increased flooding and more frequent natural disasters, said Joe Bouchard, a retired Navy captain and a former commanding officer of Norfolk Naval Station. Projections of those effects have worsened in the past five years, Bouchard said. – Adapt. Build such structures as seawalls, floodgates and levees, which are expensive and potentially damaging to the environment. - Get used to living with more water. Put houses on stilts and flood-proof ground floors. - Retreat. Move people out of the most vulnerable areas and prohibit building there. For the full video of the event, click here. By Caitlin Werrell and Francesco Femia in climate and security on May 6, 2013 .